Provides instant anchor point to attach any standard bungee cord, tie down or rope (view larger). Instantly create anchor points for bungee cords, tie downs, or rope, and secure your tarp with the TEKTON 4-piece Tarp Clips. 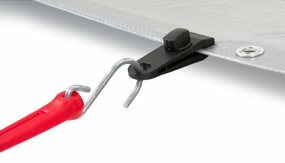 The TEKTON Tarp Clips provide instant anchor points to attach any bungee cord, tie down or rope to secure tarps, canopies and covers. The unique locking clamp design grips material directly for superior holding power. Aggressive teeth bite and hold without damaging material. Which TEKTON Tarp Anchor Accessory Is Right For You?